When people ask me where good Chinese food can be found in Edmonton, I usually stare back at the person blankly for a couple seconds, then take some time to think it out. Seriously. 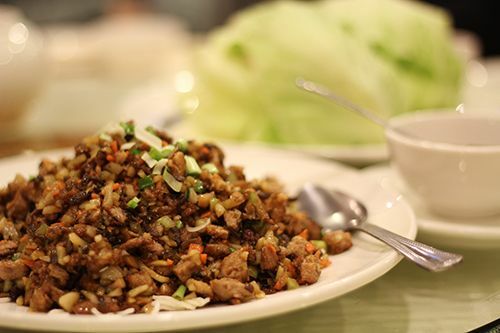 Chinese food can be quite hit and miss here in the city, and cooks are constantly changing in the kitchens, leading to varied experiences all the time. As my grandparents still live in the city, my family likes to go out for dinner every month or so - and it has to be Chinese food as the elderly won't eat anything else! We've returned to Spice Kitchen a couple times now as they've consistently delivered good service and the Chinese food is authentic and pretty good by Edmonton standards. 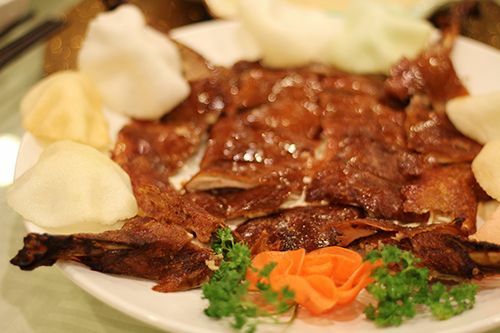 On our most recent meal, we went with the Peking Duck served three ways & a standard 7 course Chinese meal. Peking duck crepe wraps was the first dish to come out. The duck was sliced well, with a bit of meat on each portion of skin, and its served with the standard carrots, cucumber, green onion & hoisin sauce. It wasn't overly oily and quite easy to assemble for consumption. I've noticed the restaurant is pretty stingy with their hoisin sauce though, so you'll probably find your table having to ask for more. The second duck dish was the cooked meat of the duck diced up and stir friend with assorted veggies and served atop a bed of deep fried vermicelli noodles. This dish was served with a side of fresh lettuce, and the steaming hot mixture was to be wrapped up in the lettuce and eaten. The mix was steaming hot and fragrant, tasting delicious wrapped within the crunchy, cool lettuce. The dish itself is a little on the oily side though, so I wish they could cut that down a bit. 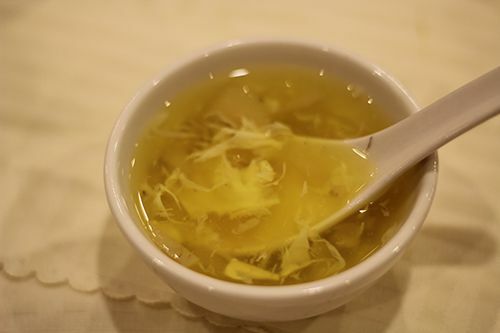 The third "course" to the meal was a clear duck soup, made with the bones of a duck carcass. The soup itself was clear, and made with tofu and suey choy. 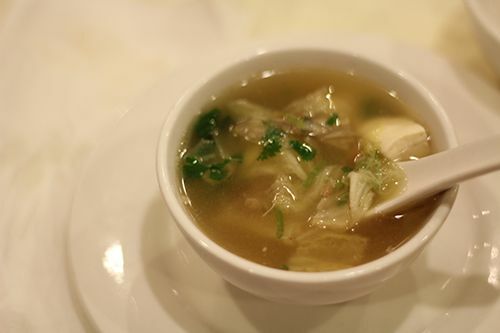 I personally love clear Chinese soups, as they warm you up and have a great nutritional value to them. This one was perfect, as it wasn't overly salty and was a nice palate cleanser. Next up to the table was an entire boiled & salted free-range chicken - sounds gross when it's said that way, but it's basically the Chinese version of a brined, sous-vide chicken without the bag. The chicken was soft and tender, with a light sesame oil brushed on the skin. 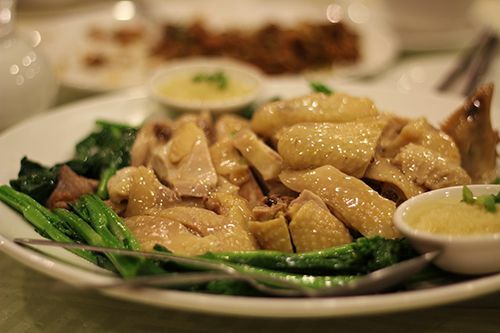 You could really taste the natural flavour of the chicken, but the ginger oil on the side was had a fresh and light flavour when eaten together with the chicken. Our next dish is pretty typical of Chinese pre-set dinner meals, and usually served inside a deep fried "birds nest". A stir fry of celery chunks, snap peas, carrots and shrimp is hard to mess up. And this dish was simply that. 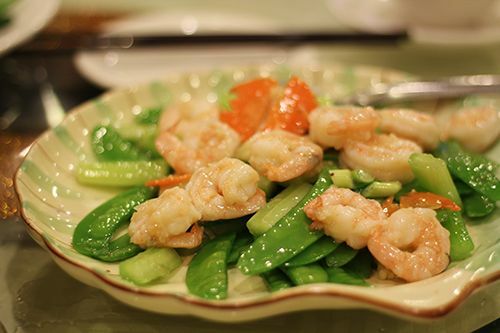 Fresh, crunchy vegetables and perfectly cooked shrimp on a plate. The next plate to the table probably ranks as having one of my favourite flavour combinations of all time. Garlicky, spicy, salty.. mm. Boneless basa fillet pieces are battered and deep fried, then tossed with a mixture of onions, garlic, chilis, salt, and pepper. It's a crisp exterior, soft interior, and the flavour is just addicting. 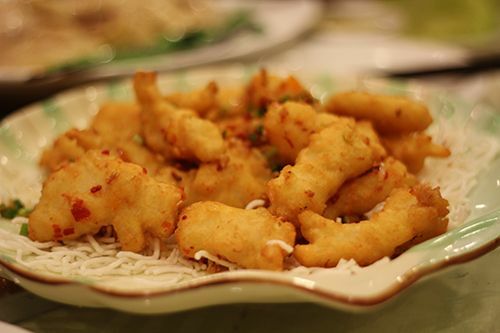 If you've ever tried the hot & dry spicy chicken from The Lingnan - it's basically the same thing but with fish. So. Good. 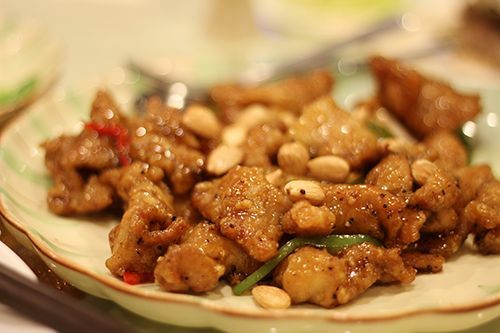 This next dish was deep fried pork tossed in a sweet and sour Chinkiang vinegar sauce with peppers and cashews. I'm not a big fan of sweet and sour dishes, but this was a big hit for my family. The sauce wasn't overly sour, and the sweetness complemented the pork nicely. You have to eat it fast though, or the meat becomes cold and soggy - and nobody wants that! Another dish included in the 7 course meal was a vegetarian dish consisting of deep fried tofu, shiitake mushrooms, baby corn, carrots, and yu choy stewed together and served on a plate. 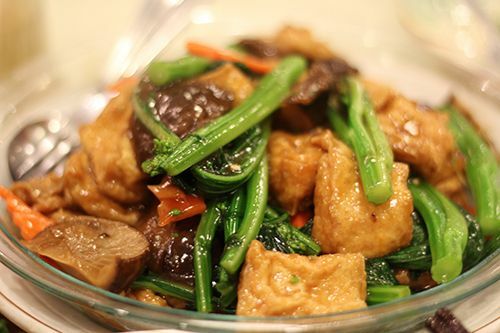 Most Chinese vegetarian dishes are served in this way, with everything marinated in the same sauce and slow simmered in the sauce for a period time to make a "stew" of sorts. The sauce had soy and garlic flavours, and each component of the dish was flavourful and not overly salty. I hate when shiitake mushrooms have been stewed for too long and are overly mushy - so these were cooked perfectly to my preference. 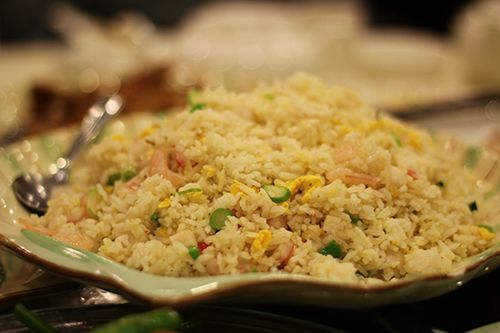 When a set meal at restaurants comes with a fried rice, it typically comes at the end of the meal, and you don't get any plain rice to eat the rest of your meal with. So for us, the last savoury dish for the night was a house special fried rice. Or what I like to call "throw whatever extra stuff we have in the fridge into the wok and fry it with rice". Seriously. This one had imitation crab, pieces of gai-lan vegetable, shrimp, scrambled egg, green onion, and some small scallop pieces. The dish wasn't overly oily, and the grains of rice didn't stick together, resulting in a light fried rice that was simple and tasty. Last but not least, all Chinese meals typically end with a dessert or some sort - in Spice Kitchen's case, they serve a dessert soup. For the particular night, they had made a simple chestnut, soy sheet & egg white dessert soup, and it honestly isn't anything special. It's basically a warm simple syrup with pieces of chestnut, soy and egg. Nothing impressive, but I was told they make a different dessert soup every night, so something more impressive should be in their rotation. Ever since this visit to Spice Kitchen, my family and I have gone to visit a couple more times. We've experienced consistent food quality and service which is great to see in the Chinese food scene here in Edmonton. It can get quite busy on the weekends, but the servers are always friendly and quite accommodating. The location is conveniently placed in the university area, and they even deliver. So those of you on campus looking for a different take out or delivery option, check this place out! Overall, it seems really delicious. Loved reading about the various dishes Andrea. Great job.